General Dynamics Corp.’s GD business division, Electric Boat, has clinched a modification contract to procure onboard repair parts for Virginia Class Submarines Pre-Commissioning Unit (PCU) New Jersey (SSN 796) and PCU Iowa (SSN 797). Work related to SSN 796 is scheduled to be over by February 2021, while that for SSN 797 is expected to be completed by August 2021. Valued at $36.5 million, the contract was awarded by the Naval Sea Systems Command, Washington, DC. The deal includes option for Block IV mechanical and electronic repair parts, which will be stored on the ship while at sea. Electric boat will utilize fiscal 2016 shipbuilding and conversion (Navy) fund to finance the task, which will be carried out in Groton, CT. The Virginia-class submarine program is a class of nuclear-powered fast-attack submarines (SSNs) serving the U.S. Navy. These submarines are designed for a broad spectrum of open-ocean and littoral missions, jointly constructed by General Dynamics and Huntington Ingalls Industries HII. Intelligence, surveillance and reconnaissance operations as well as mine warfare are also carried out by these fast-attack submarines. Notably, these vessels are one of the three classes of attack submarines used by the U.S. Navy. The other two are the Los Angeles class and the Seawolf class. Valued around $2.7 billion each, these three submarines will be operational until 2070. In December 2015, the Navy updated its force-level goal from its prior target to achieve and maintain a 308-ship fleet that comprised 48 SSNs to 355-ship fleet, including 66 SSNs. This, in turn, clearly reflects the immense priority that the U.S. Navy bestows upon this class of nuclear submarines. However, the number of SSNs is projected to decline by more than 20% over the next decade due to a smaller number of procurements done in the 90’s. This means, to reach the force-level goal, the U.S. Navy should accelerate their procurement rate in the coming days. Therefore, an increased number of procurement contracts can be expected from the Pentagon for the Virginia-Class submarines, which in turn should boost General Dynamics’ profit margin effectively. Furthermore, the U.S. Navy has acknowledged the Virginia-class program as its top priority and allotted an upmarket budget for the same. This also bodes well for General Dynamics as it is the prime contractor for this program. In a year’s time, shares of General Dynamics have lost 1.1% compared with the industry’s rally of 33.8%. 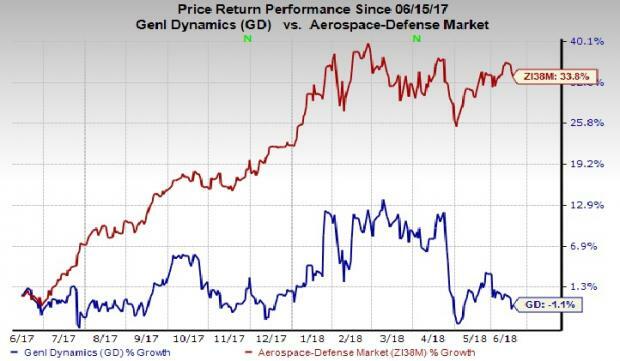 The underperformance may have been caused by the intense competition that General Dynamics faces in the aerospace-defense space. General Dynamics currently carries a Zacks Rank #3 (Hold). A few better-ranked stocks in the same industry are Northrop Grumman NOC, Boeing BA and Textron TXT. While Northrop Grumman sports a Zacks Rank #1 (Strong Buy), Boeing and Textron carry a Zacks Rank #2 (Buy). You can see the complete list of today’s Zacks #1 Rank stocks here. Northrop Grumman delivered an average positive earnings surprise of 13.87% in the last four quarters. The Zacks Consensus Estimate for 2018 earnings moved up 81 cents to $16.40 in the last 60 days. Boeing pulled off an average positive earnings surprise of 29.51% in the trailing four quarters. The Zacks Consensus Estimate for 2018 earnings climbed 62 cents to $14.67 in the last 60 days. Textron came up with an average positive earnings surprise of 16.6% in the last four quarters. The Zacks Consensus Estimate for 2018 earnings moved north 10 cents to $3.15 in the last 60 days.